I know I've left this a bit late - & I know some of us are going to this already - but if anyone else in Leabank Square is free at sometime tomorrow - please come down to Hackney Town Hall. I guess the most important thing for me is to find out more about the media centre (& it's road!) 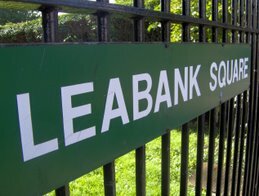 - but for some in Leabank Square - it might be to find out more about jobs on the site - or just about what it's all going to look like. Whatever your reason - please get down there - it's well worth finding out more! Hackney residents are invited to find out more about major legacy opportunities from the 2012 Olympic and Paralympic Games. The Olympic Park will be Europe’s biggest new urban park for 150 years and planning is happening now. The London Development Agency is consulting on the design and features of the Park and wants to hear local people’s ideas to ensure it meets their needs. Take your ideas to Hackney Town Hall Square, Mare Street, between 10am and 7pm, Wednesday 25 June. In 2012 all eyes will be on London. The 20,000 journalists covering the Games will need state of the art facilities to broadcast the Games to the world. After the Games, the buildings will remain as high quality office space focused on the media and creative industries. The Olympic Delivery Authority will outline its plans for the media centres – and how they fit into the legacy Park. They will also answer questions at the session in the Town Hall Assembly Rooms, from 6.30-8pm on Wednesday, 25 June. Training for Games-related work, jobs building the Olympics and volunteering are among the many opportunities 2012 is bringing local people. Find out more at Hackney Town Hall Square, between 10am and 7pm, Wednesday 25 June. A few roads right alongside the canal?